Disgaea meets the Vita. Friends? Not quite. The Evil Academy's doors are open once again, promising the zany antics and complex strategic gameplay that NIS has always been known for. For this bout, they're letting Mao and friends take the Vita hostage, but is Disgaea 3 a game that’s just as good on the go? In some ways, absolutely; in others, some growing (or shrinking) pains show. If you were itching to be reunited with your classmates in crime from Disgaea 3, this is your chance, but if you weren't so fond of that game, there's nothing here to change your mind. But as always, where Disgaea thrives is in its outside-the-box gameplay, and Absence of Detention is still bringing it with plenty of gusto – and some Vita enhancements. In Disgaea 3, you're dealing with a school in the depths of hell, so it's a twisted locale. Evil Academy plays the opposite game by rewarding the underachievers: skipping class regularly earns you the title of honor student. The best of the best? Mao, the son of the Overlord who’s plotting to kill his father, ever since his old man destroyed his precious video game save data. Those who attend class and actually learn, like Mao's rival Raspberyl, are considered delinquents. Of course, Mao's journey to become a “Hero” and defeat his father is full of plenty of setbacks and interactions with more goofy characters than imaginable in his quest to rule the Netherworld. Unfortunately, despite its over-the-top premise, Mao's adventure is a little on the bland side. See, Disgaea 3's story and cast are much weaker than those in other entries in the series; the cast members don’t resonate as strongly as they should. Too much of the game is simply overt satire and these characters become more annoying than fun, like Almaz, the fledgling hero out to save the princess. The other problem? The dialogue just isn't bursting with the typical Disgaea energy and, unfortunately, the series-standard jokes are cheesier than usual. Conversations aside, the story also runs into pacing issues, taking its sweet time to unfold. Not to mention, after the release of Disgaea 4, it's easy to see just how weak Disgaea 3's cast and writing are. There is a little light in all this darkness, thanks to entertaining, strategic gameplay that makes some of the plot mishaps forgivable. We may not have been enraptured by D3's story, but the gameplay makes it hard to put down. 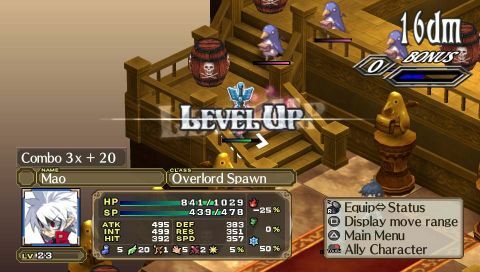 Yes, it's still the same simple strategy RPG grid based gameplay we know and love, but as many fans remember, Disgaea has some great additions like cancelable movement and geo panels. Geo panels have different properties associated with them – some can grant extra attack strength, others can decrease defense, and these perks and disadvantages extend to your enemies as long as either of you occupy the right colored geo panel. Beyond that, these panels can have their colors changed or removed, damaging enemies and allies who are stacked on the like-colored geo panel. Because of geo panels’ importance, they're highly influential in your strategy and success. Also part of your success will be utilizing mechanics like throwing units and blocks, magichanging a monster into a weapon, and evilities to give your characters an extra edge in battle. All of these mechanics can also be used in the item world, a place that exists in each item, full of random levels and enemies. These stages level up your weapon the more you fight in them, and also give you the opportunity to level grind your characters.For those unfamiliar with the series, Disgaea prides itself on being a grind fest; if you're skilled enough you can get away with some minimal grinding, but don't expect to get through the game without hopping in the item world or replaying some maps. There's fun in taking a character from level one and watching them grow, we just wish there was an easier way to level them up outside of putting extra Mana points in to buff a character a few points. The good news is that as you encounter harder levels the game will throw higher level characters your way to enter your party, which does dissipate some of the need to grind.